Shipping containers were never designed to be farms, Amyot says. Even Grade A containers come with dents and rust that must be painted over and often have structural issues within months of purchase, such as rotting steel, problems with the corrugated floor and water leaks. Worse yet for the commercial grower, some won’t pass GAP certification. The width and height of the shipping container presented a further limitation to the SmartGreens team because they didn’t allow for proper air flow and were not conducive to retrofitting. That is when he began looking for a better option. “We recognized the need for something new, but we didn’t have the experience so we went knocking on doors,” Amyot recalls. He reached out to Dr. Michael Dixon, Director of Controlled Environment Systems Research Facility at the University of Guelph and his colleague Dr. Michael Stasiak, Senior Research Associate in the School of Environmental Sciences. He also connected with leaders in LED technology, climate control, and plant health science from around the globe. 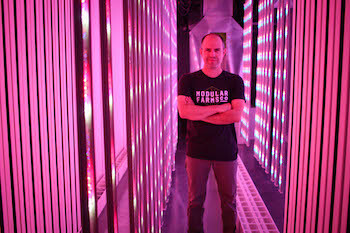 In 2015, he quietly launched Modular Farms, created the first farm, and put it to work. After ten months of testing, adjustments, and retesting, the company began selling to the public in November 2016. Modular Farm’s Primary Module is crafted from composite, rust-resistant panels and is larger than traditional shipping containers at 40’ x 10’ x 10’. This allows for adequate spacing between plants and lights and greater airflow in the farm, two areas Amyot encountered challenges with while using the shipping container. He had attempted to retrofit the container with better LED lights than the ones that came with the farm. While the new lights had excellent results in clinical trials, they damaged plants in the shipping container because it wasn’t wide enough to provide distance from the light to the plants. The LED lights in a Modular Farm are placed at the optimal distance from the plants, are customizable, and offer a low heat signature to reduce heat waste that then needs to be disbursed. The lights are crafted by Intravision Group, which produces multi-band and spectrum variable LED lights, enabling biological control and optimization of plant responses to specific wavelengths between UVA and IR light. According to Amyot, Modular Farms’ design addresses the air flow challenge not only with its increased size, but also by excluding active air exchange, meaning it is sealed from outside elements, and by offering a closed-loop air recycling system with commercial HVAC, dehumidification, and duct delivery. The farm’s exterior construction panels are rated at R22 to R35, depending on location. This means that theoretically you could grow plants in any location on earth. Modular Farms is one of the priciest container farms on the market with its Primary Module ringing in at $148,500 Canadian ($110,216 US) and estimated annual operating costs ranging from $25 – 40K Canadian ($18,555-29,688 US). “You get what you pay for is our belief,” Amyot says. While Amyot is careful not to promise anything, the Modular Farms team has seen yields of 85 kilograms (187 pounds) of leafy greens weekly and up to 84 percent better yields than with competing products. Whether or not this can deliver return on investment within a reasonable timeframe depends on the farmer’s ability – the technology is only as good as the person operating it – and the market itself. He encourages farmers to avoid competing with traditional outdoor growing operations for items they are already producing cheaply and successfully. Instead, opt for smaller niche products, such as snacking cucumbers, ghost peppers, red robin cherry tomatoes, mache, or edible orchids.